At first glance the Vertex RX –C DUO looks like a piece of technological art, instead of your standard commercial looking calcium reactor. Talk about forward thinking design, the German company Vertex has really come up with a beautifully simple and very effective reactor! 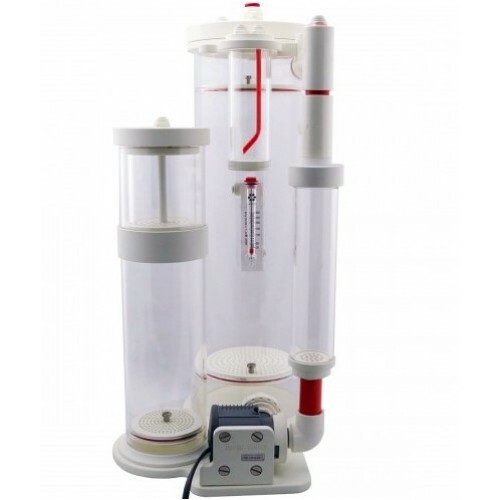 Along with the robust 6” diameter main chamber which features thick, machined acrylic throughout and a heavy threaded cap for convenient removal. There are multiple unions allowing the unit to be broken down into smaller sections to facilitate cleaning. Adding to the design are resin-epoxy sealed John Guest fittings throughout, guaranteeing years of leak-free operation. We also noted that this unit features a large capacity CO2 dissolution chamber to facilitate a maximum contact time, and a CO2 recycling and venting system is added to ensure effective use of the gas. There’s an oversized, ultra-clear bubble-counter too, so it’s easy to keep tabs on how much gas is entering the reactor. 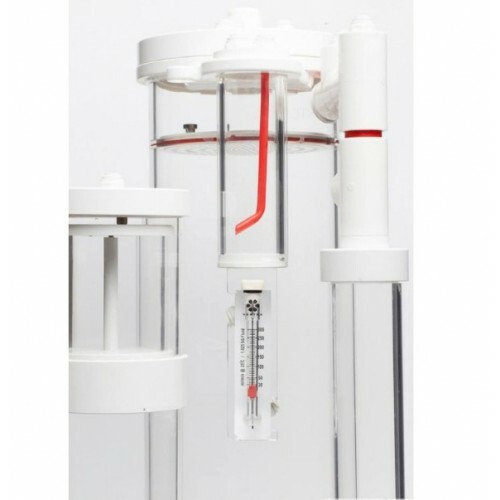 In the same vein, a gorgeous effluent flow-meter (quality not seen in Calcium Reactors before this model) allows the passage of water through the unit to be monitored and fine-tuned with a high quality needle-valve included. 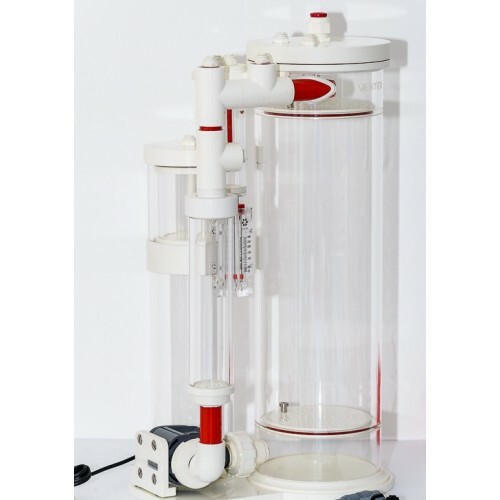 One of the primary features of the Vertex RX-C6D Calcium Reactor is the dual-tiered secondary reaction chamber (the ‘D’ standing for ‘Duo’). Filled with a suitable media, this chamber can assist in raising the effluent pH before it leaves the reactor, and the second tier section can be used for other media if desired. Finally, let’s not forget to mention the all-important pH probe port which provides for those wishing to use a controller to manage the unit. 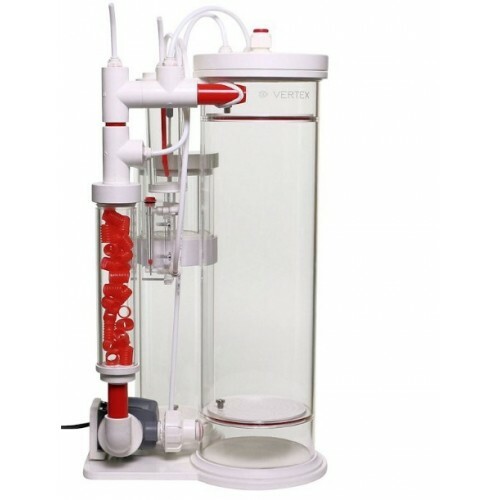 Powered by the well-received Sicce’s Syncra Silent 1.5 pump which has a 350 gph rating utilizing only 23 watts and super quite!. 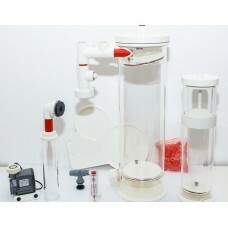 The pump stands within depressions on the 6Ds thick white PVC base-plate. 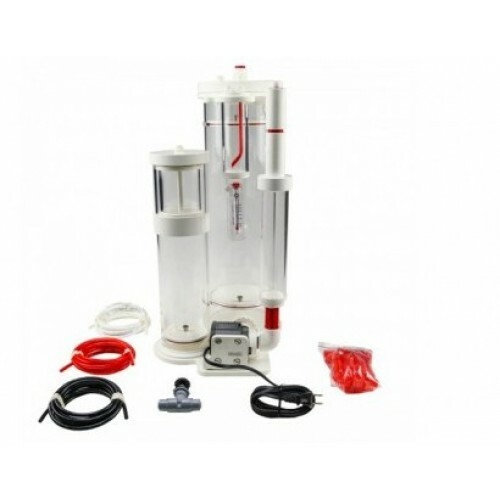 Equipped with rubber feet, the pump produces no discernable vibration. This prism-like meter really makes the 6D stand-out aesthetically and functionally in our eyes, indeed this is a reactor that really deserves to be ‘showed-off’ if you have the space.